It's rainy season here. Not much Wildlife shooting goin on, but I haven't given-up on the Wild Boar quest, yet, just slowed down a little bit. Anyway, while I'm waiting for sunshine to break out all over, I got into some Travel Writing and will post a few Links here as my stories hit the magazines. Getting on the WWW and trying to learn how people become Travel Writers has been a blast and I've met some amazing folks along the way. What's all this got to do with the picture I posted? 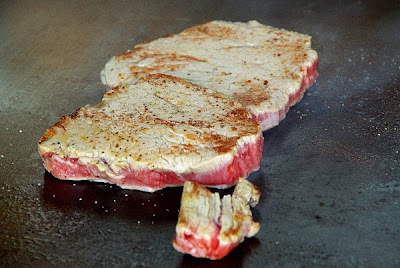 That's a $40.00 slab of Australian Steak being cooked, right in front of me at one of the most expensive Tourist Trap Restuarants in Naha Okinawa, Japan and it didn't cost me a Dime ! Tell me what you think of Nora's Article and I'll teach you how I did it !